Are you scared or nervous when it comes to cutting nails on your dog? How about your cats’ WMDs? (Weapons of Mass Destruction). However, if you are ready to combat your fear and give it a try, I’ll help you along the way. they can impede the animals’ movement, make walking painful and if they should grow with a curl, can grow into and through a toe pad causing excruciating pain and infection. When you hear clicking on the floor, it is probably nail cutting time. If your pet is touchy with its feet and nails, it is my suggestion that you don’t cut all the nails in the same sitting. There is no law that states you have to cut all the nails at once. You can cut one or two nails a day if you want, especially if your pet is fighting you or is finicky with its paws. You may notice that only certain nails need to be shortened. 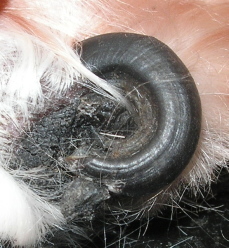 Usually, on dogs, the middle two nails on each foot, require regular attention. When dogs walk, run and turn, it is the outside toes that maintain the balance and grip (especially when turning at a run). Because the outside toes do most of the work, the nails experience a greater amount of friction and get worn down more. However, if your dog is obese, elderly or relatively lazy, there may not be a lot of friction to wear down the nails. You may also notice that either the front nails or the back nails are shorter. I like to describe dogs this way. If your dog is a rear wheel drive, the nails on the rear feet will be shorter as the dogs’ power is in its hind end. When taking off in a run, Fido will push its body forward, using the back feet and nails to propel forward. If your dog is a front wheel drive, its power is in the front end. It will pull itself forward using the front toes and nails. An all-wheel drive dog can alternately push and pull itself. Less active or obese dogs often do not create enough friction between the ground and the nails to cause significant wearing of the nails naturally. Felines on the other hand try to keep shortened nails on their own; unfortunately, your furniture pays the price. Keeping your kitty’s nails short will lessen the chance of replacing furniture every few years. Always make sure kitty has a scratching post available. The easiest way to keep your dogs nails short is to run them on pavement, hard packed dirt, gravel or any hard surface. A nice easy walk does not supply enough friction to wear down the nails, running or jogging does. If using pavement, only allow this in the morning or evening when the pavement is cool, to reduce the chance of blisters on the feet. If your dog pulls on the leash, well, stand still and let them scramble on the pavement without going forward. This is best done while the dog is wearing a harness to prevent choking. If he plays ball, toss the ball in a parking lot a couple of times. Too much parking lot play can cause blisters or scrapes on the pads, so keep the ball tossing to a couple of throws. 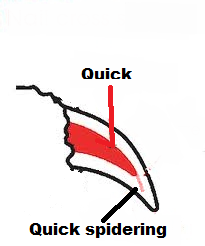 The quick is the blood vessel that goes part way into the nail. 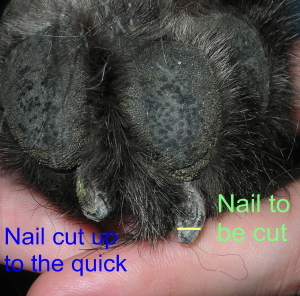 The quick is easy to see on dogs with white nails and very easy to see on cats. It is the pink. If you cut the nail too short, and they bleed, you have cut the quick. To stop the bleeding, you can put a pinch of a specialize power created to aid in clotting, found at any pet store. However, if you don’t have any powder on hand, a pinch of corn starch or flour will help to stop the flow of blood. Is it true that keeping the nails short will keep the quick short? Honestly, I can’t say yes to that question. I have seen dogs with excessively long nails have very short quicks. 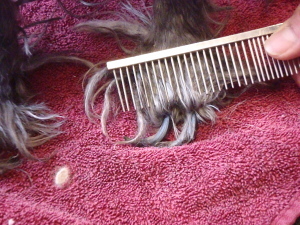 I have been very diligent with one of my own dogs, keeping the nails trimmed and it didn’t make a difference in the length of the quick whether I kept the nails short or let them grow long. What I can tell you for certain is that the quicks will not grow past the pads of the toe. The easiest time for cutting nails is after a bath. The nails soften from the water and tend not to splinter. 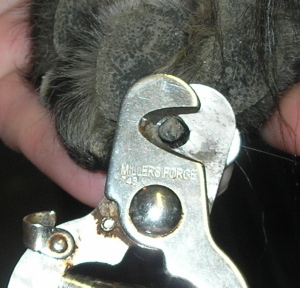 The nail cutters cut them easily and there is less discomfort on the little doggie toes. White nails are easier to trim than black nails. Do Not Cut up to the pink If you cut flush with the pink, you greatly increase the chance of cutting into the quick. There should always be a few millimeters of white left beyond the quick. On some nails, the quick has a small vein that spiders away from the bulk of the quick. If you cut the nail close to the quick you will often cut the little spider vein. Leave a few millimeters of nail beyond the quick and you stand a better chance of missing the small, spidering vein. The safest way to aim for cutting dark nails (or white nails for that matter), is line up the nail cutters flat with the pad of the foot. Cut the nail straight across rather than at an angle. This is easiest done by bending the foot so the pads face upward. 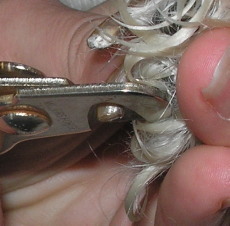 Lay the clippers on the bottom of the pad (with the nail in the cutting part) and clip off the nail that is sticking through. 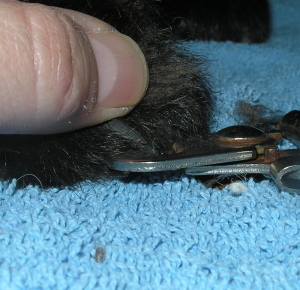 Whether your dog has white or black nails, the safest way to cut the nail is to line the clippers up with the pad the nail is attached to and clip what is hanging through. You may have to push on the toe slightly to push the nail through a bit. 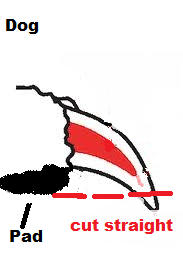 By cutting straight across the nail rather than at an angle, you lessen the chance of nicking the quick. 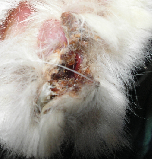 Dew claws are the claws that grow on the inside of the leg above the foot. They are actually the thumb (on the front leg) and the big toe (on the back leg). The dew claws need constant attention as they get little if any, wear and tear which means they don’t wear down. Dew claws can quickly grow around and through the pad. 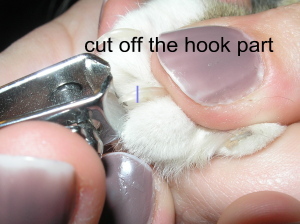 If the nail has grown to the point that you can’t get the nail clippers around the nail, go to either the veterinarian or groomer to have it cut. There are a variety of grinders for nails on the market today. If your dog is comfortable with his feet being handled and comfortable with the noise, you’ll probably be able to grind the nails rather than cut them. It’s not as easy as they show on the commercials to use. Before you buy a grinder, stop into a grooming shop and ask them to test your dog on a nail grinder to see how he reacts to it. The groomer may even be willing to teach you the proper way to use one. Many dogs that have had their nails cut too short, may be foot shy and may even attack you if you try to cut their nails. Even a groomer or vet may not be able to cut them. For dogs with this problem, I suggest simply filling them with a nail file or emery board. Yes it will take longer, but remember, who cares if you only do one nail a day? Removing the weapons of mass destruction (nails) can be an adventure in itself. If you cut your cats' nails on a regular basis, (starting when they were kittens helps a lot), the cat should tolerate it. 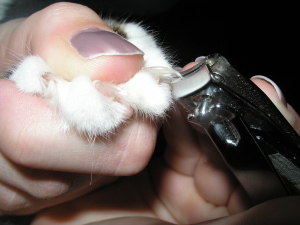 If you have a feisty feline, cutting one nail a day or every couple of days may be an option. If your cat gets upset, stop. It is better to do one nail at a time than get hurt trying to do all the nails at once. 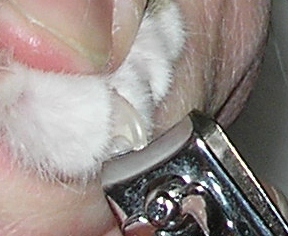 Cat scratches and bites can be very dangerous because of all the bacteria attached to the nails or teeth. Winding up in the hospital from a cat scratch or bite is not uncommon. Is it necessary to cut your cats nails? Yes, especially if they are indoor cats. Cats shorten their nails by scratching either on wood, or your furniture. Keeping a scratching post available and their nails short lessens the chance of them scratching your furniture. Typically, we cut the front nails more often than the back nails as cats are rear wheel drive. However, for an inactive cat, all four feet should be trimmed often. You can use either a pair of pet nail cutters or a set of human toe nail cutters. The actual cutting is easy as the nails are usually white and the quick is easy to see. Hold the cat on your lap or get someone else to hold her. Gently squeeze her toes just enough so the nails extend. Cut off the hook part of the nail, again, don’t cut flush with the quick. What can happen if I don’t cut my cat’s nails? If the nails get too long, it’s easy for them to get caught in carpet and tear. The nails cat also grow around and thorough the pad, especially if the cat has been severely matted for an extended length of time. This is a picture from a Persian cat. The nail had grown around, through the pad and came out on the top of the toe. The picture above is the bottom of the cats foot. You’re looking at the toe pad that had been flayed by one nail. 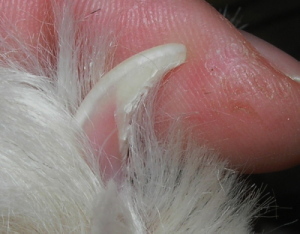 This is why it is important to give your cat regular nail trims at home.